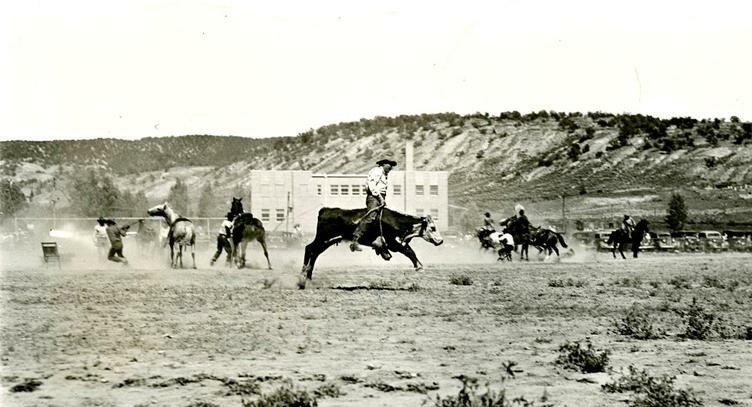 A 1939 rodeo in the park area. Notice the courthouse in the background. 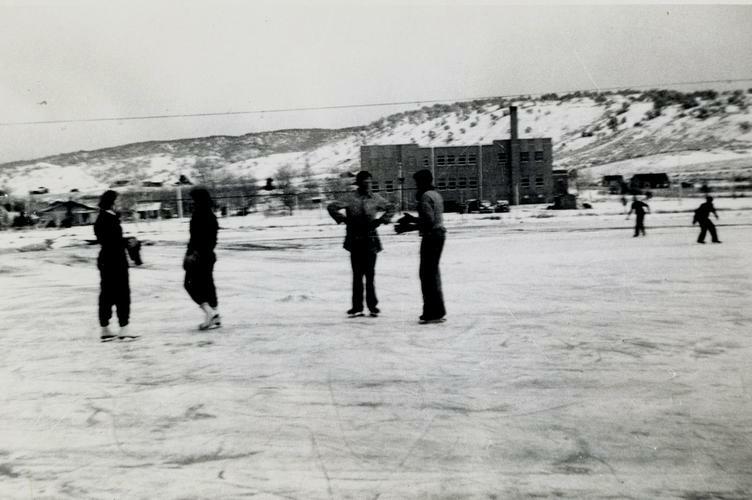 Skaters in Eagle Town Park in the 1930s. In 1907, just two years after Eagle became an incorporated town, the push for a public park began. The effort was headed by George Haubrich, editor of the Eagle Valley Enterprise newspaper. In 1910, three blocks of land west from Broadway to Washington Street between Fifth Street and Sixth Streets were acquired by the town. Two of these blocks were donated by local citizens Peter Thoborg and Harvey Dice. The eastern most block was eventually used for the County Courthouse, which was built in 1932. The remaining two lots have served as community recreation space for over 100 years. Always an important community amenity, the park has evolved and changed over time. In the early 1920s a baseball field with wooden bleachers was created in the northeast corner for the town ball team. The ball field remained the center of park activities until the end of the 1970s. The town had grown and many more ball players were using the field including youth leagues and adult softball. The town built restrooms and the ball field was relocated to the southwest corner of the park. By the late 1980s the field was so popular that lights were installed to accommodate more playing time. 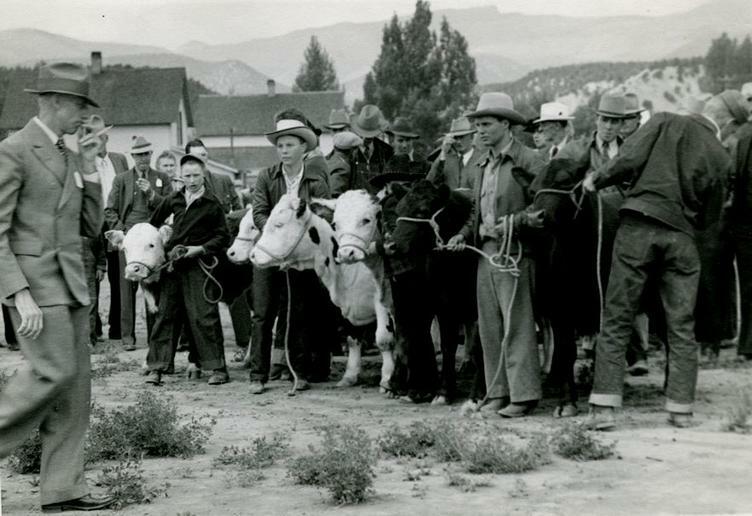 Eagle County’s first “Eagle County Fair and Fall Festival” was held at the park in 1939. The animal exhibits and competitions were staged in the park area and on the ball field. Rodeos were also held in the park area. Some were held directly on the ball field, with spectators seated in the ball field grandstand. Ice skating has always been popular in the park. In the 1930s the rink was built on the baseball field. Local businessman Eldon Wilson strung lights at the rink to accommodate night skating. This rink also served as the local hockey rink for adult and youth leagues until Eagle’s indoor rink opened in 2003. By the 1950s, the park included a playground with a slide, swings and a teeter-totter. In the late 1960s, a basketball court and a tennis court were added to the park. As Eagle has grown a number of athletic specific facilities have been built in the community. The Eagle Town Park has evolved into more of a community and family social gathering spot. For many decades, the Eagle Town Park has come alive during the last weekend in June for the annual Flight Days celebration. In more recent times the Eagle Town Park is busy year-round with events including the Eagle Fourth of July bike parade, the Twelfth-Night Christmas tree bonfire and the “ShowDownTown” summer concert series. The Centennial Stage commemorates the town’s 100th anniversary in 2005. Credit those early pioneers who recognized the need for a town park for the citizens of Eagle.